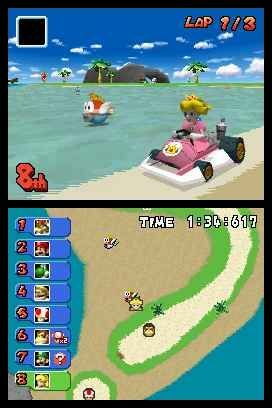 Mario Kart DS zooms onto Nintendo's amazing hand-held with new weapons, tracks and multi-player modes. Should it take first place in your DS racing game collection? Mario Kart is one of Nintendo's best loved franchises. Originating on the Super Nintendo way back in 1992, the game has raced its way on to pretty much every Nintendo console since then. With such a dedicated fan base and such a long history, can the DS version of Mario Kart please both fans and newcomers, or is this version better left on the sidelines? If you are unfamiliar with the Mario Kart formula, the concept is simple. Mario and several of the characters from his games are placed in karts and pitted against each other on the race track. The tracks are set in cartoon surroundings such as haunted castles, giant pinball tables and penguin inhabited frozen wastes. The tracks are littered with obstacles and short-cuts, as well as lots of mystery boxes which contain various weapons and power-ups. These range from a temporary speed boost to the infamous red and blue shells which home in on your opponents, causing them to spin and slow down. The constant battling and powering up makes for some extremely frantic, fun and close races. Mario Kart DS continues this tradition in fine style. There are 15 different power-ups to use over a total of 32 different tracks. The bulk of the single player game lies in the grand prix challenges. These are available in 50cc, 100cc, and 150cc classes. As you progress through each one, your kart gets faster and your opponents get better. Completing them also unlocks new tracks, characters and karts. Each kart has different ratings for speed, acceleration, weight, handling and drift (more on drifting later). It will take most players some experimentation before they find a kart that suits them perfectly. So, to the most important question, how well does the game play? The main action takes place on the top screen, with the touch screen showing a map of the circuit. Handling of the karts is really easy, letting new players focus their attention on learning the circuits and experimenting with the many collectable power ups. Like so many classic video games, however, Mario Kart is easy to learn but not so easy to master. The DS version was the first to introduce drifting. Triggered by holding down the jump button (yes, the karts can jump, did we neglect to mention that?). Drifting allows you to take faster, more aggressive lines through many corners and if you rock the d-pad left and right, it also gives you a small speed boost. Mastering this technique makes you feel like you can take on anything, but in reality it only gives a moderate advantage over those who don't use it. Then again, even a moderate advantage can mean a lot in a racing game. If you should get tired of racing, there are time trials, where the obsessive can go to shave those precious few milliseconds from their lap times. There's also a mission mode that presents a series of 54 challenges, such as destroying items with shells or driving through gates. There are even "boss battles" to attempt after every 9 missions. Sometimes this involves simply racing another character, other times you'll have to defeat them with shells or knock them from the track.